Sympathyplaques.com is primarily a supplier of high quality Memorial Stones, Plaques, Benches, and Angels. All wholesale purchases must be made by a licensed retailer. Retailers will be required to provide a tax identification number before shipment of an order. Wholesale orders are delivered in one of two ways depending upon your location. If you are within one of our truck routes we deliver by van. 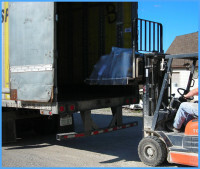 For those outside the truck route we will packaged your order on pallets and ship it to you by common carrier.